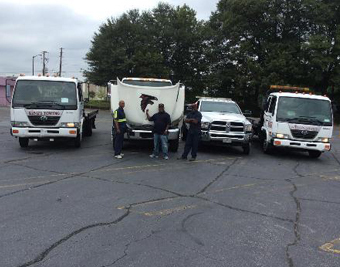 King's Towing Atlanta GA specializes in all light duty towing services. Our dispatchers provide true 24-hour personalized service, which means there is never an answering machine or answering service. Our dispatch staff is trained to assess your requirements quickly and send the correct King's Towing Atlanta GA vehicle on its way within minutes. Every safety precaution is observed to ensure a safe ride to your vehicle’s destination. King's Towing Atlanta GA fleet of rollbacks is on the highways of our city, state and region every day, delivering a wide variety of vehicles to their destinations. We offer special tie-down equipment for motorcycles, removable rails for wider loads, and wheel lifts for multiple vehicle transport. With state of the art 21 ft flatbeds, we have all the right tools to handle your domestic or import vehicles with the utmost care. King's Towing Atlanta GA has safely delivered countless high value vehicles to showrooms, museums and private collections all over the area . Every single tow occurs goes under rigorous multiple-point inspection, and we are proud of the safety record of our operators. Wider, longer, heavier vehicles are no problem for King's Towing Atlanta GA . In most cases we can send the right rollback on its way to you within minutes of your call. We have a strong fleet of 4 trucks available 24 hours a day, 7 days a week, 365 days a year to handle all of your towing and recovery needs.